It’s a Ridgefield tradition. 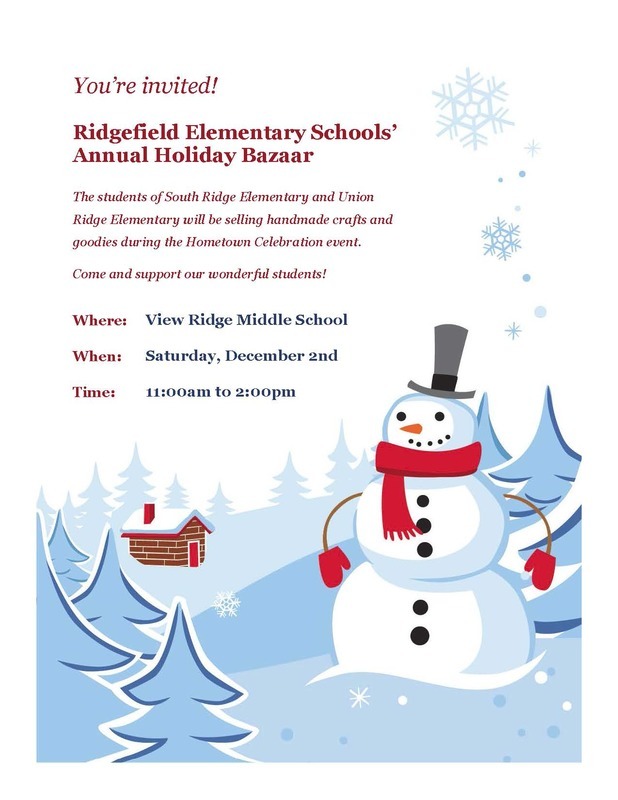 Both elementary schools in the Ridgefield School District will hold their Elementary Schools’ Annual Holiday Bazaar on Saturday, December 2 from 11:00 am to 2:00 pm at View Ridge Middle School. The bazaar will take place during the city of Ridgefield’s annual Hometown Celebration. All goods available for sale at the bazaar will be created by students at both schools. The bazaar, which is student-led, gives students a fun and educational experience by providing them an opportunity to create products and learn to market and price them in a real marketplace environment. Products will include handmade crafts and non-perishable goodies, all priced at $20 or less. The district is grateful to the Union Ridge Elementary School PTO and the South Ridge Elementary School PTA for organizing this event.